While many teachers and coaches undertake professional development courses during the summer, St. Michael’s basketball coach Cooper Land was able to design a course of his own. Land spent two weeks with Identity Hoops International, an organization that uses basketball as a platform to partner with local churches and missionaries to engage, mentor and equip athletes. Land coached a team of nine former college basketball players aged 22-26 with aspirations to play professional basketball. After a stint at training camp in Phoenix, Arizona, the group set off to the Philippines for 10 days of basketball games, missionary work, and small group study sessions. Land’s small-group study and discipleship sessions compelled each of the nine basketball players to open up and talk about the experiences and relationships that defined their lives. “Most of them had never openly talked about such personal matters, and the things that were revealed during those sessions were life changing,” said Land. 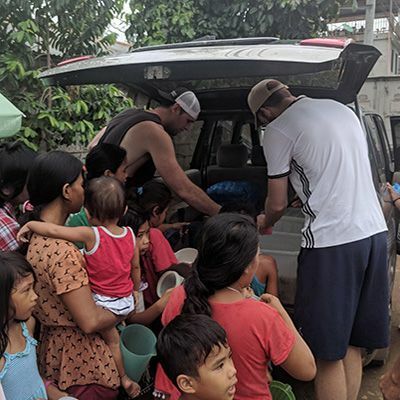 The group’s missionary work included serving a soup line out of the back of a truck.